Design Addict Mom: How I Care for My Fiddle Fig and Hello! How I Care for My Fiddle Fig and Hello! Hi everyone! It’s been awhile since my last post, but, I am sure by now, you know that the hubby is home. In fact, he returned home the same day of my last post. The above quote by the late and amazingly wise Maya Angelou, sums up my current state of mind and being, and I am enjoying being in this state. With that said, though I haven’t been blogging, I’ve been quite the chatterbox on Instagram! I’ve posted different stages showing the growth of my fiddle fig which has amassed a number of admirers on there. Admirers who want to know what the heck I’m feeding this monster of a tree! So, I’m sharing how I care for my fiddle fig today. I invited Lea of Lea Hartman Photography to come by to capture it all for you! As usual, she did a fabulous job! 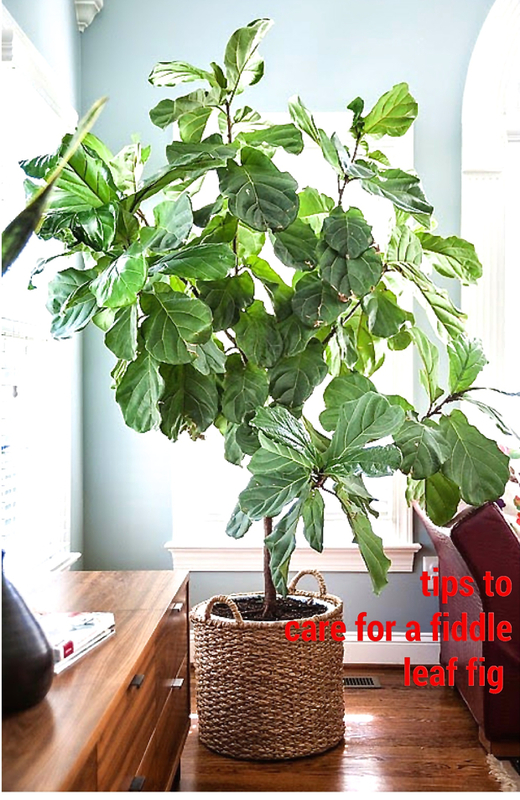 Well, I believe the location/placement of your fiddle fig is probably the most important. In my case, our fiddle fig is in the sunroom. The sunroom is East facing so the fiddle fig gets perfect natural light; morning sun and afternoon shade. Keeping your fiddle fig hydrated is very important. It loves getting watered. I can usually tell that mine needs water if the leaves look a bit shriveled and dry. Fiddle leaf figs are tropical loving plants and are accustomed to high humidity, consistent temperatures and well-draining, peaty soil. When the plants receive too little water, new foliage browns and eventually falls off. Conversely, when plants are over-watered -- or heavy soil becomes waterlogged -- damage begins at the base of the plant and the oldest leaves turn brown and drop. Allow over-watered figs to dry thoroughly. Fiddle leaf figs should be allowed to dry out between waterings and then watered deeply until water runs out the bottom of the container. Also, I’ve recently rotated it as I noticed that the leaves tend to lean toward the light, and as a result it was growing in that leaning sort of way. Rotating it helps it maintain a rounded shape. And that’s basically how I care for my fiddle fig. If you have a Home Depot in your area, they may have them there. That’s where I purchased mine. Now, you might be wondering about the sunroom, well, it’s left mostly undecorated as it is the boys’ stomping ground; well the entire house is. We aren’t a formal household, but one could say that this is our informal space. I removed the coffee table and freed up the space in the middle. Better for the boys too. This mushroom stool was in Ian’s nursery, but I stole it and it’s perfect for resting things aka magazines on. PS - love your fiddle leaf!! That tree is just gorgeous! Thanks for the info on care. I love it and will be looking for one. I *almost* want a Fiddle Fig of my own but I literally have a black thumb. I've killed three plants in the last month alone! Yay, hubby is home!! I am so excited for you. I love your home and this amazing room. Your fiddle fig is stunning. I think I might need to stop into Home Depot myself this week!! :) Thanks for all of the tips on how to care for it. I will need it! No need to explain Stacey dear, I follow you on IG so I know how happy and busy you've been! ENJOY and live the moment indeed! Thanks for the tip on the fiddle, I may need to follow your tips since out of my 4, one seems to be 'sick'!!!!! Hope I can still save it, re-potting is something I need to do too if I want them to be bigger! Good morning most GORGEOUS ONE! Yikes, you need to be, you ought to be a model in a mag! Who took these photos...the husbs? Well the quality is outstanding, and you? You look so happy dearest Stacy! That hot pink chair is fabulous and your home is just stunning. Please stay here in Blogland, pleeeeeeeeese? HAPPY MONDAY with the man! That's a great fig. It's obviously very happy in that room. Hi Stacy! Such a great photo of you at the top:) and I'm so happy to hear the family is back together. Thank you for the tour and tips on how to care for your fiddle tree. Yours looks very healthy! Welcome back! Love your home!!! Missed you! Love this joyful space you have here! I also love fig trees but that scare me as I have been known to finish off house trees! I would love one though! Happy Monday! What a beautiful photograph of you, my friend!!! Oh my goodness, you look so beautiful and glamorous sitting there with your ridiculously-healthy fiddle leaf. Sadly, house plants and me are a very bad combination….I manage to kill most of them…you make it sound simple but you obviously have the GREEN THUMB which is required!!! ps - the whole room looks brilliant - so inviting and colourful. It's glowing like you are. What a great picture of you and what fun colorful interiors! I need a fig tree!! I admire your designs and strength to do all this diy. Reunited with hubby, enjoy that and I bet he will be totally loving all that you have created for his return. hello to your hubby, enjoy! Stacey, I love LOVE all the colors in your sunroom! The fiddle fig is the perfect natural addition as well! Your space looks great!! I have 2 fiddle leafs and can't wait for them to reach that height! Hey, your fiddle fig is so enormous and good looking! I have one but is so tiny. Your tree is absolutely gorgeous! I have a bit of a brown thumb and bought 5 fiddle leaf figs at my local ikea, assuming a few would die. They seem to be very happy and have grown a couple feet, but how do you get them to branch out like yours? Mine are growing straight up which isn't the look I was shooting for. Thanks in advance! Hi Stacy. Glad I remembered seeing this post as I just today bought my first fiddle-leaf fig. Fingers crossed I don't kill it! Do you have any tips on repotting -- like when to do so (time of year) and soil to use, etc.? I'm a total newb at repotting, but my fiddle leaf has been doing amazing and I don't want to disturb it! Spring is a great time to repot. Usually when the roots start surfacing is a sign that repotting is needed.